With only two days to explore an 18-deck ship with 27 dining options, a handful of different performances and a full on water park, you better believe we at The Cruise Web were a little overwhelmed while on the Norwegian Breakaway. After the initial shock of just how beautiful and new this ship is, we all made as many reservations for specialty dining and performances as possible and set out to discover all that we could. Read along to find out what our staff of expert cruise consultants and cruise support staff thought were the best aspects of the ship! I’ve been on several ships and have seen some pretty cool things on cruises, but I have to say the coolest part of the Breakaway is the free-fall water slide. There’s just nothing quite like having the floor drop out from underneath you, sending you shooting down a water slide that actually sends you upwards at one point! This is by far my favorite part of the Breakaway. 678 Ocean Place was my most favorite part of the brand new Norwegian Breakaway because it was incredibly beautiful and there was so much to do. You could go shopping, dine, have a drink, play at the casino, or just relax and people watch. I loved Fat Cats Jazz & Blues Club. Slam Allen is the best entertainer I’ve seen on a cruise ship! The variety of food options was the best part of the ship because I am a foodie and like to try different cuisines. The Cirque Dreams and Dinner Jungle Fantasy show was my most favorite part of the brand new Norwegian Breakaway because you get great entertainment paired with great, flavorful food. Very impressive! The Haven suite area was my most favorite part of the brand new Norwegian Breakaway because of how exclusive and luxurious it is. Having a nice glass of chardonnay while relaxing in the exclusive lounge was a sweet memory. Fat Cats Jazz & Blues Club was my favorite part of the Breakaway because it features an amazing performance by guitarist Slam Allen. Mr. Allen is incredible! The live, electric band of guitar, bass, piano and drums sets the stage for authentic Mississippi delta-style blues and jazz. It is a very lively, interactive club where you can sing along to old favorites, dance if you like or just sit back and enjoy the music while sipping on your favorite cocktail. Allen even invites people in the audience to come up and play. It’s like an old school jam session and every performance is different because it is based on the crowd’s participation and interaction. There is even outside seating on the “waterfront” area. I could have stayed there all night! Cirque Dreams was my favorite part of the Norwegian Breakaway because the show was amazing. The actors/actresses were so athletic and artistic, and the costumes were fantastic. The Haven Suites were my most favorite part of the brand new Norwegian Breakaway because of all of the perks that come along with the suites, including the private restaurant and the exclusive bar and pool area. The Mandara Spa was my most favorite part of the brand new Norwegian Breakaway because the floor-to-ceiling windows provided a panoramic ocean view to partake in while you relaxed or indulged in any of the various steam baths, saunas and soaking baths. The digital lockers were literally “cool” because they didn’t use a metal key, which can burn your skin in the sauna or hot-tub! 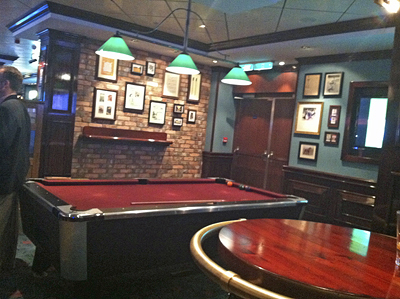 O’Sheehan’s was my most favorite part of the brand new Norwegian Breakaway because they had duckpin bowling. I do not remember the last time I went duckpin bowling and I think I may have to go again soon. I also loved that they had pool tables, darts, video racing games, two basketball machines so you could compete against other opponents and Pac-Man and Asteroid video games. Any bar that has Pac-Man is alright with me. Ocean Blue by Geoffrey Zakarian was my most favorite part of the Breakaway because the service and atmosphere were delightful, and the cuisine was 5-star. The Ice Bar was my most favorite part of the brand new Norwegian Breakaway because it was very refreshing and different. The drink names are inspired by New York and served in frozen glasses made of ice. I had the Yellow Cab, which had vodka, peach schnapps and orange juice. Even the ice sculptures featured some of New York’s famous buildings like The Empire State Building and the Statue of Liberty. The seating was all made of ice blocks that were covered in a nice warm furry material. It was an awesome experience. 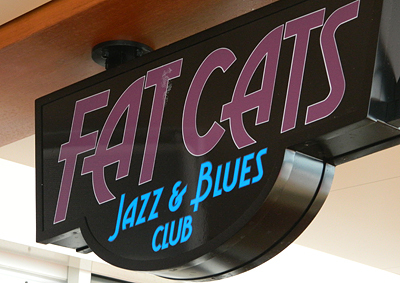 The Fat Cats Jazz & Blues Club was my most favorite part of the brand new Norwegian Breakaway because Slam Allen, the lead singer of the group, is unbelievable. He does a great job of engaging the crowd and keeping everyone tapping their feet. He’s also known to call on audience members to sing or play guitar! The variety of entertainment choices onboard was my favorite part of the brand new Norwegian Breakaway. The ship featured the Broadway show Rock of Ages, the “Burn the Floor” ballroom dance show located in the main dining room, the Cirque Dreams and Dinner Jungle Fantasy in the Spiegel Tent, the Fat Cats Jazz and Blues Club, Headliners Comedy Club featuring improv from The Second City, and “Howl at the Moon,” the dueling piano bar that rocked… what a potpourri of fun! The Atrium on deck 6 was my most favorite part of the Breakaway because it was a luxurious space to sit and catch up with friends. The seats were cushy and chic, Carlo’s Bake Shop was right there for a quick treat and the huge two-story video screen had lots of beautiful images of New York City to inspire the mind. Now it’s your turn to fill in the blanks. Which of our favorites most excites you? Experience the Breakaway on your own, check out the great deals on Norwegian cruises and find a sailing. 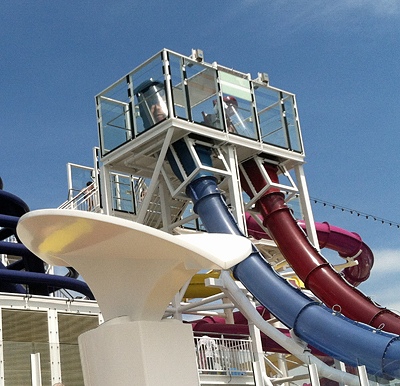 Then, after you’ve experienced the Norwegian Breakaway, come back and let us know what you were most impressed by. I am avid cruiser. Your ship peaked my interest. Would like to try a short cruise. The Norwegian Breakaway is a fantastic ship. Right now that ship is only sailing 7-day itineraries. If you are looking for something shorter, maybe a 3 or 4-day sailing, we can help you find an itinerary that would fit your needs. 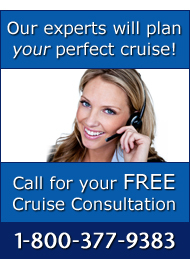 One of our cruise consultants will send you an email with an overview of some options. Slam Allen made the cruise for us. Went 5 nights and every time was different. Authentic old school jamming with incredibly talented Slam and musicians in his band and from the audience. Great venue too. Best entertainment on a cruise ship. Susan – So glad to hear you enjoyed Slam Allen. He is definitely a highlight of the Breakaway. this will be our first time on a cruise and it will be our honeymoon we are getting married oct 17. we are so excited craig’s mom sister step dad and brother in law as well as his parents just got off the the ship sept 14. and they all had fantastic things to say about this cruise.